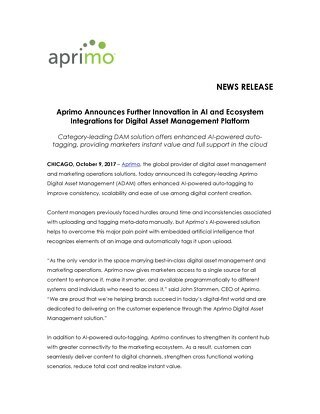 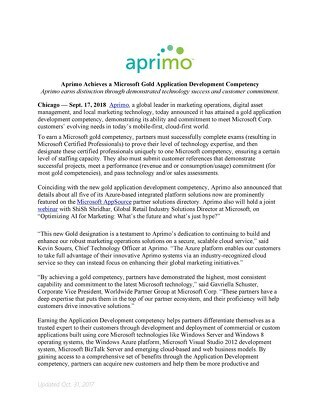 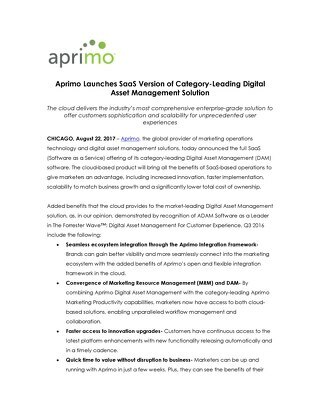 CHICAGO – September 19, 2018 - Aprimo, a global leader in marketing operations technology and digital asset management (DAM), today announced the promotion of Todd Rathje to Chief Customer Officer. 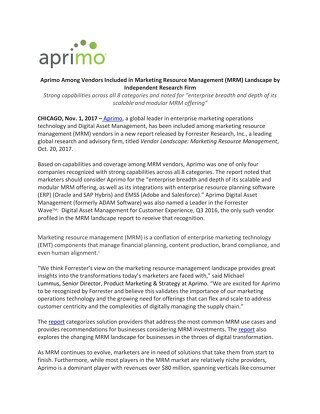 Previously, Rathje served as Senior Vice President of Americas for Aprimo. 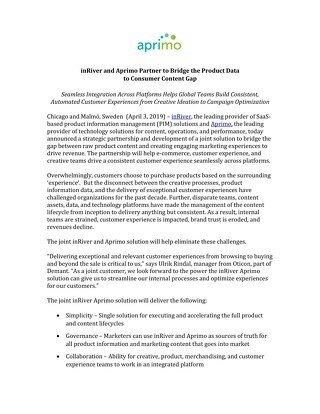 As Chief Customer Officer, Rathje will be completely dedicated to customer success and growth, along with driving customer success into all aspects of Aprimo’s business. 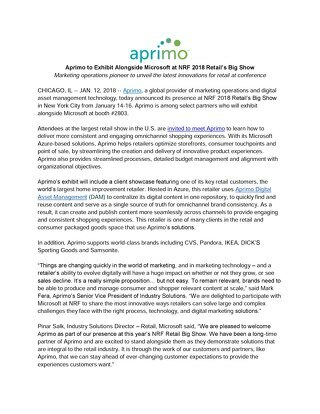 Globally, he will serve as the functional leader operating as the conduit to share best practices to grow relationships and value within customers. 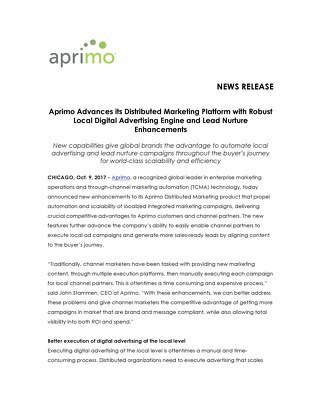 The new position will guide Aprimo down a focused path to be even more strategic with customers to drive mutual value. 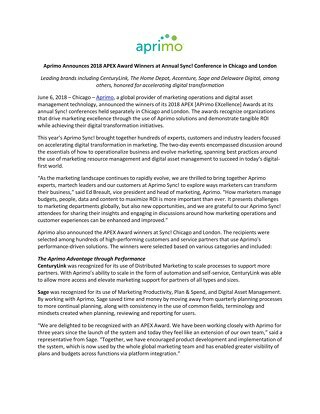 Both the heads of Americas East and West customer success teams will report to Rathje along with the Australia, New Zealand and Asian organization. 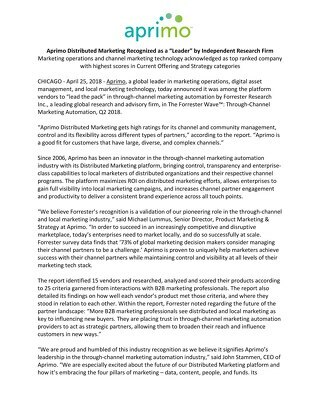 Rathje brings more than two decades of experience leading and developing high-performance teams across emerging marketing technology sectors. 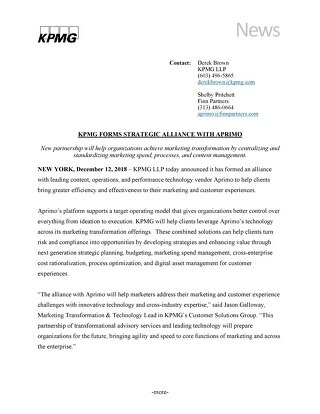 He first joined Aprimo in 2002 and has spent almost his entire career in MarTech, internet, and networked technologies. 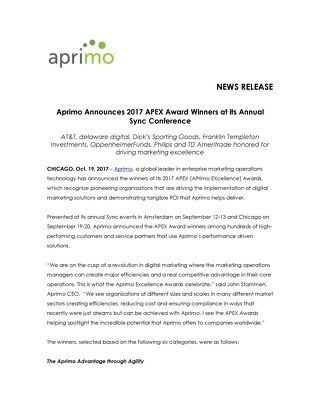 Prior to rejoining Aprimo in 2016, Todd served in various positions including SVP of Revenew, AVP at Sprinklr and Managing Partner at US Web/CKS. 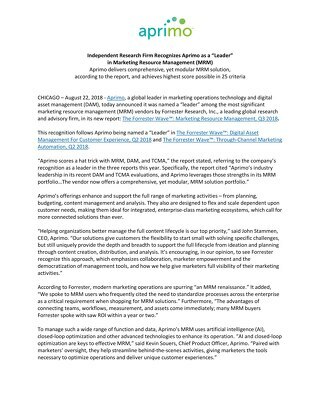 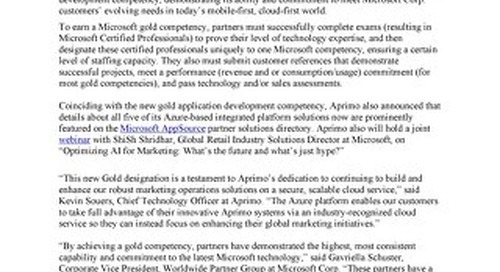 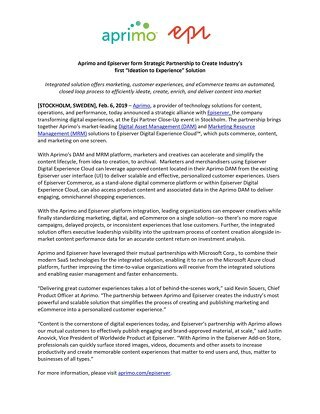 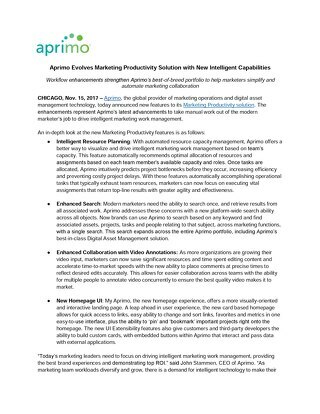 News of Rathje’s promotion follows recent company momentum, including Aprimo being recognized as a “leader” in The Forrester Wave™: Marketing Resource Management, Q3 2018. 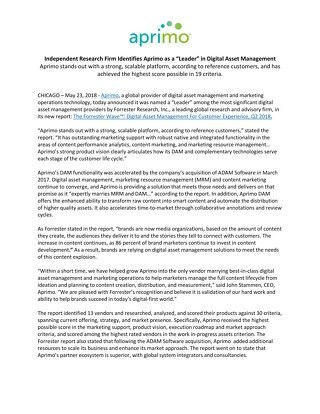 This also follows recognition as a “Leader” in The Forrester Wave™: Digital Asset Management For Customer Experience, Q2 2018and The Forrester Wave™: Through-Channel Marketing Automation, Q2 2018. 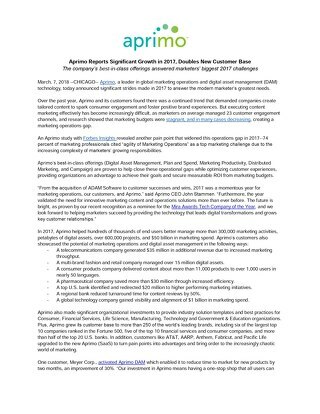 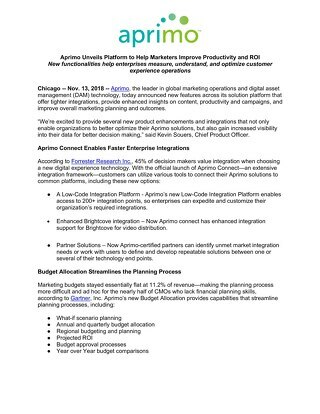 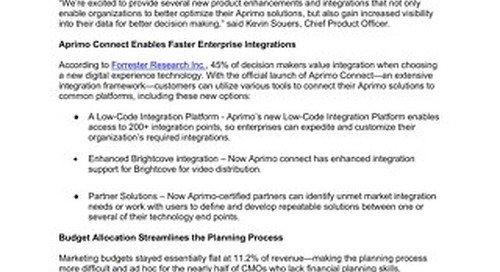 Aprimo’s best-in-class offerings (Digital Asset Management, Plan and Spend, Marketing Productivity, Distributed Marketing, and Campaign) are proven to help close operational gaps while optimizing customer experiences, providing organizations an advantage to achieve their goals and secure measurable ROI from marketing budgets. 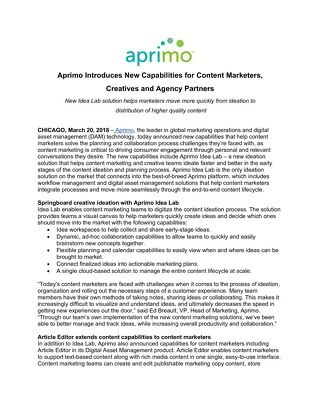 Aprimo provides technology solutions for content, operations, and performance that enable enterprises to optimize their brand experiences and the resources they use to deliver them. 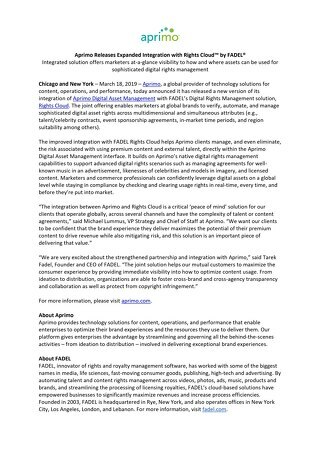 We allow marketers to manage budgets, people, data, and content throughout the ideation, workflow, and campaign delivery of the brand experience while maximizing provable ROI. 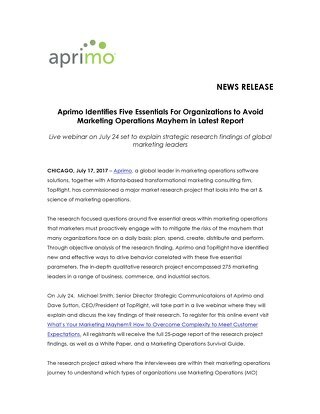 For more information visit www.aprimo.com.